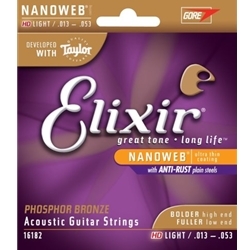 Elixir 16182 Coated Phosphur Bronze Strings are Hard to Beat..
Elixir Nanoweb HD Light Strings have a bolder high end and fuller low end with a balanced voice across all the strings. This was achieved by blending the plain steel strings of a medium gauge set with the wound strings of a light gauge set, bridged by a custom .025 third string. The increased tension of the treble strings improves their articulation. The interaction of the tension profile with the soundboard also adds to the harmonic content of the bass strings. The result is a new phosphor bronze tone that offers a balanced voice across all the strings and a light, comfortable hand feel.